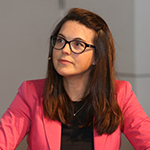 Sophia Eriksson Waterschoot is Director for Youth, Education and Erasmus+ at the European Commission’s Directorate General for Education, Youth, Sport and Culture. She is in charge of Europe’s flagship programme Erasmus+, the newly launched European Solidarity Corps, European cooperation on schools, higher education and youth policy. She has previously held various positions within the Commission in the field of strategy and investment in education, higher education policy, employment policy and the European social fund. She studied international economics at Uppsala University in Sweden and did an Erasmus student exchange in Montpellier in France. She is an Eisenhower Fellow.